Vocal cord paralysis due to recurrent laryngeal nerve injury is a well-known complication in infants and children undergoing cardiovascular surgery, particularly after procedures such as the ligation or clipping of patent ductus arteriosus, repair of an interrupted aortic arch or coarctation of the aorta, and the Norwood operation. Currently, the gold standard method for examining the vocal cords is a direct flexible laryngoscopy, which is an invasive procedure associated with patient discomfort and fear. Although ultrasonographic assessments of vocal cord movement were first reported in pediatric cardiac intensive care units in 2017,1, 2) there is still no report about it in Japanese pediatric population. We herein report the use of laryngeal ultrasonography for the early postoperative assessment of vocal cord paralysis in an infant who had undergone surgery for complex coarctation of the aorta. A 3-month-old male infant was admitted to another hospital because of cough, stridor, and poor feeding. The infant was born at a gestational age of 37 weeks with a birth weight of 3,024 g, and had an uneventful perinatal period. Echocardiography revealed coarctation of the aorta and a double outlet right ventricle with a subaortic ventricular septal defect. Three-dimensional computed tomographic angiography showed vascular compression of the left main bronchus due to the right pulmonary artery. After transfer to our institution, a single-stage repair for the aortic coarctation and associated intracardiac defects was performed. After the induction of general anesthesia, a central venous catheter was placed in the right internal jugular vein, and transesophageal echocardiography was used for intraoperative monitoring. Following a median sternotomy, cardiopulmonary bypass was established by arterial cannulation of the brachiocephalic artery and the descending aorta and bicaval venous cannulation with moderate hypothermia. The aortic arch was reconstructed after the complete resection of the coarctation tissues and by an extended end-to-end anastomosis. The intracardiac defects were repaired with the anterior translocation of the right pulmonary artery. Cardiopulmonary bypass time was 246 minutes, and aortic cross-clamping time was 130 minutes. A delayed sternal closure was performed on postoperative day (POD) 3. Tracheal extubation was successfully accomplished on POD 10, and the patient experienced mild hoarseness after extubation. A bedside laryngeal ultrasonography using the LOGIQ e Premium Ultrasound System (GE Healthcare, Tokyo, Japan) was performed on POD 15 to assess vocal cord movement. A wide-band high-frequency (6.7–18 MHz) linear array transducer (L8–18i) was placed in the axial plane just caudal to the thyroid cartilage such that it was angled towards the external occipital protuberance in the supine position with the anterior neck well-extended (Fig. 1). True vocal cords and arytenoids were carefully identified. The left vocal cord was found to be fixed on both inspiration and expiration, and the arytenoids were asymmetrically located, suggesting left recurrent laryngeal nerve paralysis (Fig. 2; Movie). The patient was started on nasogastric tube feeding to avoid aspiration. Direct flexible laryngoscopy was performed by an otolaryngologist to confirm the diagnosis and to evaluate swallowing function on POD 25 (Fig. 3). The left vocal cord continued to remain fixed during respiration, but the swallowing reflex was intact without salivary pooling in the valleculae and piriform sinuses. Subsequently, the patient could tolerate oral intake with the help of swallowing therapists, and was discharged on POD 34. 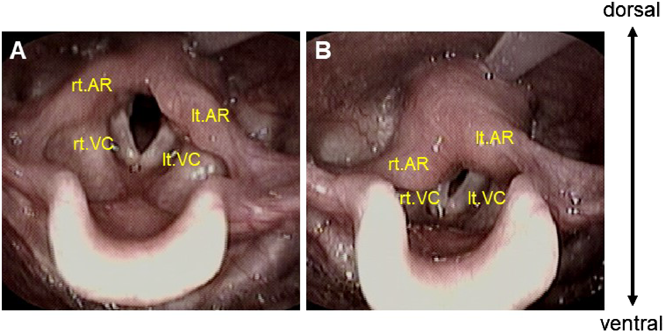 The left vocal cord was fixed and the arytenoids were located asymmetrically (A) on inspiration, (B) on expiration. (C) Schema. TC; Thyroid cartilage, rt.VC; right true vocal cord, lt.VC, left true vocal cord; rt.AR, right arytenoid; lt.AR, left arytenoid. (A) on inspiration, (B) on expiration. rt.VC, right true vocal cord; lt.VC, left true vocal cord; rt.AR, right arytenoid; lt.AR, left arytenoid. Vocal cord paralysis due to recurrent laryngeal nerve injury or traction following cardiovascular surgery can be caused by various factors, such as a median sternotomy, interventions against the patent ductus arteriosus or the aortic arch, systemic hypothermia and topical cooling, electrocautery, transesophageal echocardiography, central venous catheterization, and endotracheal tube.3) The common symptoms of vocal cord paralysis are hoarseness, stridor, and choking or coughing. It is often associated with swallowing difficulties and aspiration, that contribute to postoperative morbidity and a prolonged hospital stay.4) Patients with vocal cord paralysis require diet modifications, such as nasogastric or orogastric tube feeding, to protect the lungs from aspiration pneumonia. 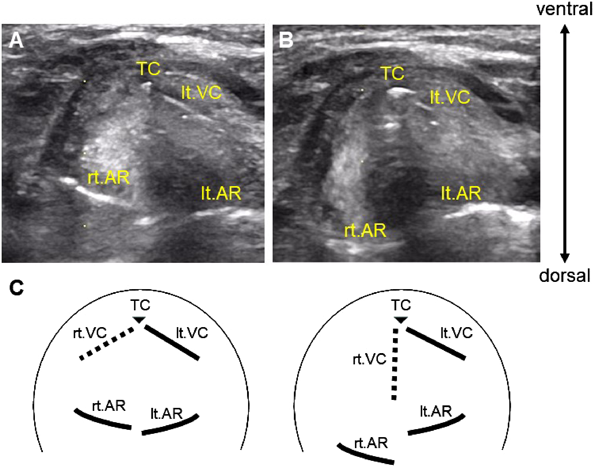 Laryngeal ultrasonography for the assessment of vocal cord movement is not a new concept, but its clinical utility as a routine examination tool has been limited by the relative absence of information on its validity and reliability. Recently, bedside transcutaneous laryngeal ultrasonography has been gaining popularity among physicians as an assessment tool for vocal cord function after thyroid and parathyroid surgery and has proven to be a promising alternative to laryngoscopy as it has a reported sensitivity of more than 90%.5) Ongkasuwan et al.2) demonstrated that laryngeal ultrasonography has a sensitivity of 0.84 and a specificity of 0.95 for identifying vocal fold motion impairment after pediatric cardiac surgery. To the best of our knowledge, this is the first report showing ultrasonographic assessments of vocal cord paralysis after pediatric cardiac surgery in Japan. At our institution, bedside laryngeal ultrasonography has been performed since October 2017. Although we cannot demonstrate the statistical sensitivity and specificity of our ultrasound assessment because of the small number of patients at this time, the findings of vocal cord movement were concurrent between laryngeal ultrasonography and laryngoscopy in 9 of 10 patients. Compared with adults, endolaryngeal structures in infants and children can be well visualized using ultrasound imaging because of smaller body habitus and lesser interference by air and calcification. On the other hand, the vocal cord position related to breathing and phonation is widely fluctuated in infants. Vocal cord movement through inspiratory and expiratory phases may be difficult to visualize on the same view of pediatric laryngeal ultrasonography. Because ultrasound images of bilateral arytenoid cartilages are easy to obtain, observing their movement is helpful to diagnose vocal cord paralysis. Our case report shows that ultrasonographic assessment of vocal cords after extubation is effective in establishing an early diagnosis and that it helps us plan an appropriate management strategy; both of these lead to positive effects, such as a decrease in morbidity and shortening of the duration of hospitalization. The most important advantages of laryngeal ultrasonography are non-invasiveness, ease of performance, and cost and time effectiveness. Because laryngeal ultrasonography can be easily learnt and practiced by physicians, it can reduce referrals to an otolaryngologist. 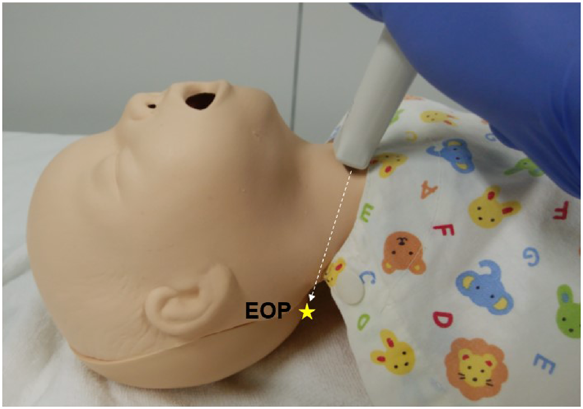 Thus, bedside laryngeal ultrasonography can be used as an initial assessment tool for postoperative vocal cord function in the pediatric cardiac intensive care unit.